When I was a younger man I went out of my way three times to meet Ray Bradbury. I won’t belabor the obvious again, but it was Bradbury’s magic touch of poetic emotion that took me on journeys to hear him speak and to share a few words with him. 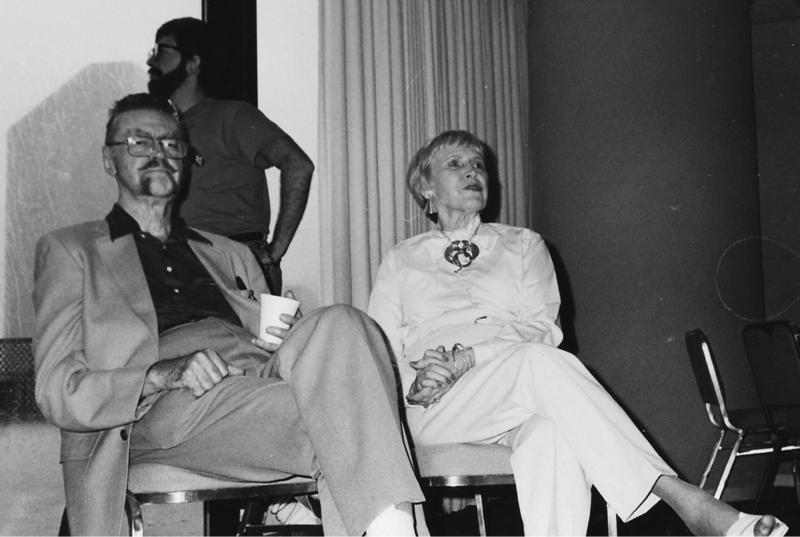 But, on one of those occasions (in 1986) I was surprised to find that another guest at the writers gathering was L. Sprague deCamp. As with Bradbury’s fiction, I had grown up reading the stories of deCamp. In fact, his stories probably influenced me more than those of Bradbury. He was–to my way of thinking, these days–a finer and more accomplished author than Bradbury. But, although I had many a chance that long weekend, I never once talked with deCamp and only went to hear him speak a single time, and that one on a panel with Bradbury in attendance. And, of course, the fans showered the lovable Ray with questions and attention, and barely paid deCamp any mind whatsoever. So he had only a slice of opportunity to speak and to impart his accumulated years of authorial wisdom. One thing that I remember about him in that panel is that he was dressed like some kind of European out to explore Africa (this was in super-hot and humid Atlanta, after all). He was wearing khaki shorts and shirt and even had (at least this is how I remember it) a pith helmet. In my now forty-year-old memories, deCamp was a small man, and his wife accompanied him everywhere. Whenever I saw him, there she was. Catherine Crook was an amazing woman and writer herself. I later found out that he only survived her by six months in the year 2000 when they both died at the age of 92. There are many stories by Bradbury that entranced me as a kid. But I can say the same of deCamp, even if only a few of his yarns come to the fore of my aging brain. It was mainly his greater body of work that left a stamp on the gray matter, rather than many individual tales. But two of his short works that I read as a child are foremost in my mind and I think of them often, even when I’m not writing. They are “The Gnarly Man“, and “Living Fossil“. The first deals with the immortality of a Neanderthal and the deceit of modern humans; and the latter with human extinction and the rise of a species of South American monkey that rules the planet. I cannot stress to people how important these stories have been to me over the years. They are both based on themes that have always fascinated me and which influence my thinking practically, scientifically, politically, and philosophically. And neither of them seems to have any overt reason for existing on any of those points, except peripherally. And therein lies the mark of a truly talented author. I have replayed my near-encounter with deCamp for decades. Of course I wish that I had spoken to him, if only to tell him that his stories and novels meant a great deal to me. That would have been enough. But, of course, I did not do that. I was there to meet the treacly Ray Bradbury, and that is what I did. One thing that remains stuck in my mind is that during the panel–after the fans had ignored him for long minutes–deCamp finally got a chance to get a word in and he referred to Bradbury as his “competitor”. At the time I thought that was a poor choice of term and that he probably meant “colleague”. These days, I know better. He meant what he said. And these days I am sad because in just straight terms of drooling, vacuous puppy love, Bradbury won that sad competition. Of course I also realize that deCamp wasn’t a contestant in that kind of race. All he wanted to do was produce fine work. Let the gawkers have their hero-worship. I’ll just stand aside and admire L. Sprague deCamp. L. Sprague deCamp and Catherine Crook.